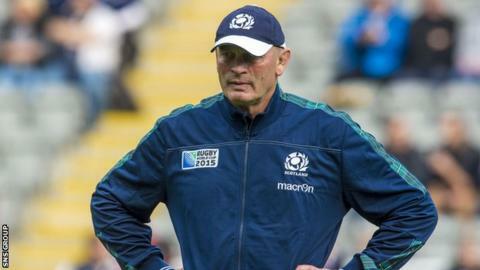 Scottish Rugby is wise not to commit to the same coaching staff for the next World Cup, according to former international Scott Hastings. All members of Vern Cotter's backroom team have followed the head coach in signing contract extensions to the summer of 2017. Japan will stage the World Cup in 2019. "It's a results-driven business and while Scotland can reflect on a good World Cup, remember there was a Six Nations Wooden Spoon," said Hastings. Scotland reached the last eight of this year's World Cup, losing out to a controversial late penalty against Australia at Twickenham. And Cotter's men will go into the Six Nations in February looking to atone for a miserable whitewash last time. "The succession planning has worked well for this team," Hastings told BBC Scotland after assistants Matt Taylor and Jonathan Humphries agreed their new deals. "Things are in place and Jason O'Halloran is also coming in from New Zealand to strengthen the coaching team. "But we have had a few false dawns in the past and it's up to the players to deliver on the back of this strong announcement." Edinburgh's Alan Solomons and Glasgow's Gregor Townsend are also contracted up to 2017. Asked if either man could figure as a future Scotland head coach, Hastings, capped 65 times, replied: "Potentially, very much so." However, the former centre is heartened by the World Cup display under Cotter, who took up the Scotland post in time for the summer tour of 2014. "I think everybody can see there is an improvement within this Scotland team," he added. "Can they eliminate the errors from their game and build on that World Cup performance going into the Six Nations? "First up is England [6 February at Murrayfield] and it's important to get on the front foot and build momentum and continuity which will allow the succession planning to continue. "There is a strong foundation there but Scotland teams need to start winning because if they don't there will be moves."